SOUTHERN FRIED CABBAGE 'N BACON. This is an old stand-by "soul" recipe A simple but delicious meal. In the military (U.S.C.G.) where I served my time as a cook, this was every bit as popular as the famous SOS or chipped beef on a shingle. the core from the cabbage pieces. Cut the cabbage into a large 1 inch dice. about 20 minutes. 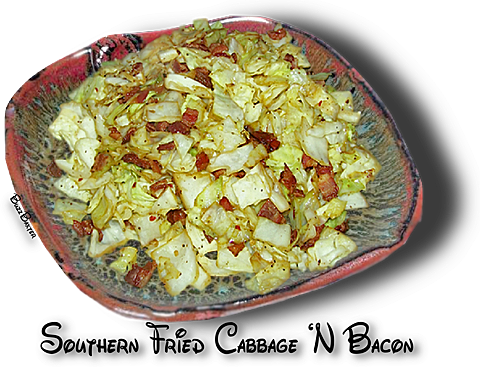 Crumble the cooked bacon into the cabbage and serve hot.